Our children are the most precious cargo we transport in life. Being a mom of three, the first-born in 2002 and the last in 2013, I feel I have gone through the car seat purchasing rodeo a few times. I have watched as car seats and car seat safety has evolved over the past 15 years. It’s crazy to think that in 2002, when my first daughter was born, it was not thought to be unsafe to have your child in their winter coat while in their car seat. Fast forward to 2013 when our sweet Bella was born, and that was no longer the case. It’s hard to say that any of my children were more precious than the others, but it is slightly true. Bella was born 6+ weeks premature weighing just over 4 pounds. She was the tiniest of my girls, even when she was released from NICU and able to come home she was still incredibly small. Her final test before being released was the car seat test. She had to be in her seat for an hour without any drop in her vitals, thankfully she passed with flying colours. I wanted to share with you some tips to ensure your children are as safe as possible while in a vehicle. 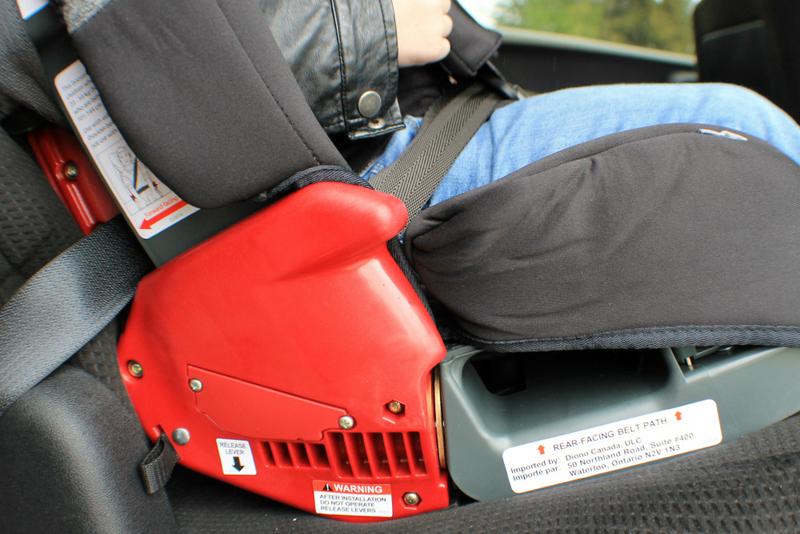 Below are 7 car seat safety tips that every parent should know. Look at the high height and weight limits. You want a car seat that allows the rear-facing position as long as possible. In the forward-facing position they should use the harness straps until they have exceeded the maximum height and weight. 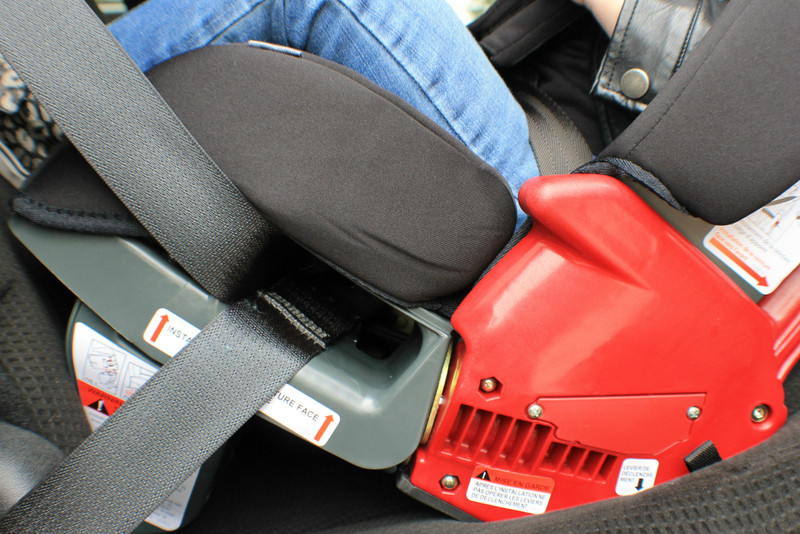 As soon as your child exceeds the maximum height and weight for their forward-facing seat with a harness, they should be moved to a booster seat. Children should stay in a booster seat until they are over the age of eight, weigh more than 80 lbs, and are over 4 feet 9 inches in height. Read the vehicle owner’s manual on how to select a seating position and how to install the car seat using the seat belt or UAS system. Once your seat is installed, if done correctly, it should not move more than an inch in any direction. If you are concerned with your installation you can look into car seat clinics in your area to ensure your seat is installed properly. Car seat harness straps do not retract and tighten during an accident like car seat belts do. It is very important to ensure your child’s harness is as snug as possible. You will know your harness is snug enough if you are unable to pinch a horizontal fold at their collarbone. If their chest clip is not at the proper position the harness can slip off, increasing the risk of your child being ejected should you be in an accident. The chest clip should always be at the same height as your child’s armpits. Use of the tether strap is required with all forward-facing car seats. Check your vehicles owner manual for instructions on where to secure the tether strap properly. A tether strap needs to be tight and not have anything in its way. Your child should remain in a rear-facing car seat for as long as possible. Most children are not physically developed enough and do not have the upper body control needed to sustain the impact of a collision in a forward-facing position at the standard minimum. Experts recommend using a rear-facing car seat even after your exceeds the standard minimum to switch to forward-facing. Products like bunting bags, car seat inserts or padded covers for straps that were not tested with your seat can be extremely dangerous. Only use products that have been tested to be safe with your car seat. Children should not wear bulky clothing or winter coats/pants while in their car seat. Studies have shown how dangerous it can be. The bulkiness can cause your straps to not be tightened properly which can lead to serious injury in an accident. Once secured in their seat put their coat on backwards. Bring a blanket from home to place on top of them. If you are crafty or have someone local who makes them, car seat ponchos are great too. 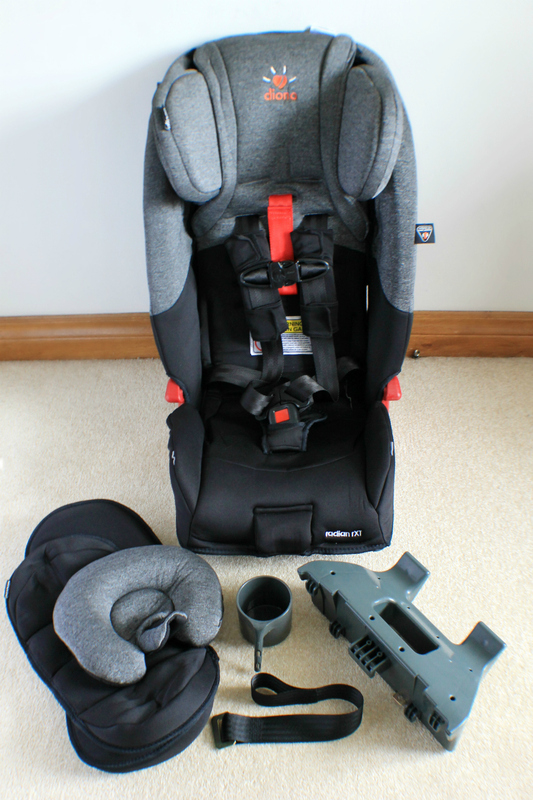 The diono radian rXT is made from premium materials and amazing safety features. It has a steel alloy frame, aluminum reinforced side walls, and energy absorbing EPS foam. The seat also has a reinforced adjustable head support which provides additional side impact protection. The diono radian rXT is perfect for those looking to do extended rear-facing. Children from 5 to 45 lbs have the ability to be rear-faced. 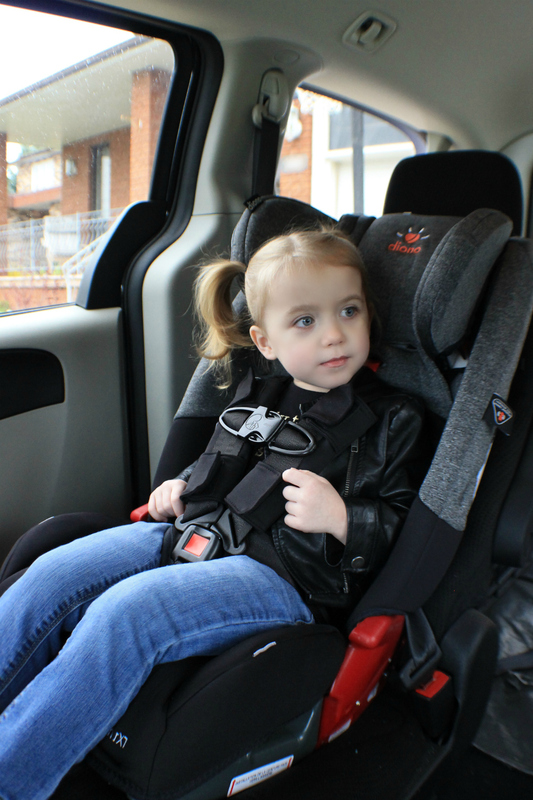 For older rear-facing children, the diono radian angle adjuster is a must-have. It improves backseat space and allows for a more upright angle. Diono radian rXT car seats accommodate children in the forward-facing position from 22 to 65 lbs using the 5-point harness, up to 57″ in height. This seat also converts to a booster for children weighing 50 to 120 lbs or up to 57″ in height. The seat was easy to install in the rear-facing position. Steve appreciated that the belt path area is more open than our previous seat. It made getting the belt through much easier for him. Bella’s previous seat was impossible to do extended rear-facing. I was extremely happy that this is an option with the diono radian rXT. We purchased the diono radian angle adjuster from Amazon to allow for a more upright position, it should be delivered soon. Bella is very comfortable in the rear-facing position. She is 3 years old in this photo. I feel better about her safety having her rear-facing for as long as possible. The switch to forward facing was very easy. Steve appreciated how simple and straight-forward the instructions are. If you are a more visual person like myself, you can watch installation videos on the diono website. Unlike our previous car seat, the diono radian rXT has superior comfort. I can already tell that the straps are not digging into her and she is not uncomfortable thanks to the memory foam. Have any other car seat safety tips to add? Have a favourite feature on the diono radian rXT? Let us know in the comment section below! Buy the diono radian rXT at Amazon and Well.ca. 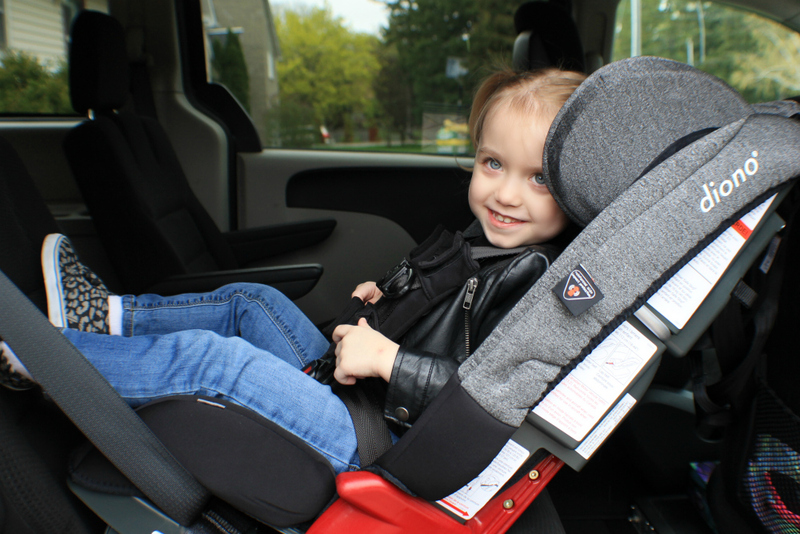 As mentioned above, the diono angle adjuster is a great addition to have for those wishing to have a more upright angle for their older rear-facing child. Buy it on Amazon and Well.ca. Another must-have in my opinion is the diono Ultra Mat. It prevents indentations in vehicle upholstery and car seat slips. The Ultra Mat has bottom organizer pockets and is easy to clean. Buy it on Amazon and Well.ca. Stay up-to-date with all things diono by following them on Facebook, Twitter, Pinterest, Instagram, and YouTube. Disclosure: Although we were sent product for review consideration, the opinions and language are all my own, and in no way do they reflect diono. Any product claim, statistic, quote or other representation about a product or service should be verified with the manufacturer, company, provider or party in question. « Is The Amazon Prime Membership Worth It? Great tips! My sister has this seat, and loves it! 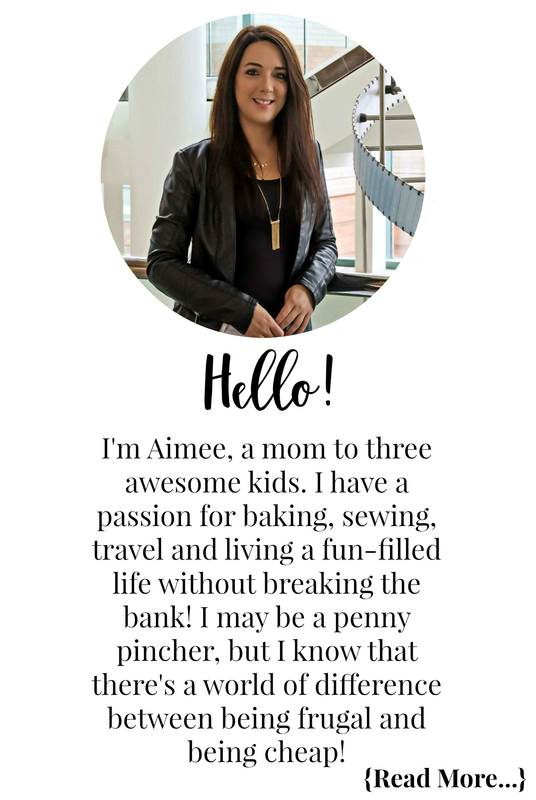 You’ve got great advice and there’s nothing more important than your children being safe.